Journal of Poultry, Fisheries & Wildlife Sciences provides an illuminating overview of the Advances in Poultry research, poultry science, fish culture, lifve stock production and, wild life. The journal includes a wide range of fields in its discipline to create a platform for the authors to make their contribution towards the journal and the editorial office promises peer reviewing for the submitted manuscripts to ensure quality. 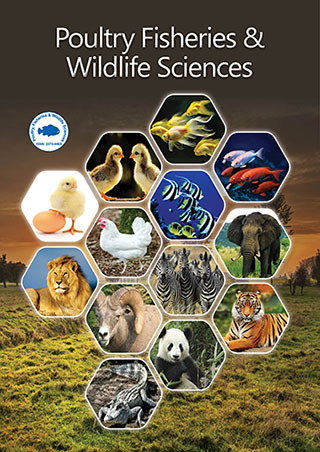 Poultry, Fisheries & Wildlife Sciences is a peer reviewed journal, serving the International Scientific Community offering an Open Access platform to the authors to publish their research outcome. Poultry, Fisheries & Wildlife Sciences aims to publish the most complete and reliable source of information on the discoveries and current developments as original articles, review articles, case reports, short communications, etc. in all areas of the field, making them available online to the researchers worldwide without any subscriptions. The journal is using Editorial Manager System for quality in online manuscript submission, review and tracking. Editorial board members of the Journal of Child &Adolescent Behaviour or outside experts review the submitted manuscripts; at least two independent reviewer’s approval followed by the editor is required for the acceptance of any citable manuscript.